Much stress. I'll tell you later. Sounds about right to me. And I actually LIKED the sequel trilogy. Comparatively speaking. Overall, I like the ST as well, but I can definitely see where the "rule of cool" has overriden other story considerations. I really wish that they had folks who would break stories with these directors and writers. Both with respect to the audience's meta-knowledge about the story, and the knowledge and behavior of characters within it. Is anyone here a Marvel fan? How are the Marvel movies received by the pre-MCU fandom? Has there been anything like the mass hatred directed at the new Star Wars films? I'm a big Marvel fan and other than some groans about Thor 2 and Iron Man 2, both of which I liked, but was in the minority, the comic fans are very happy with the MCU. Consistently every time we think they're shipping what looks like a hacker (film so bad you hack and retch while viewing) they surprise us with a quality product. The group running Disney's MCU has mostly managed to remain true to the comics while updating the characters, all while telling an engrossing overall narrative. I keep wishing they'd clone the MCU guys and put them in charge of Star Wars. In talking about the upcoming Captain Marvel movie, they make a point of saying "We've drawn the CHARACTER heavily from Kelly Sue Deconnick's 2012 run, but the story is not directly from there." It was something I liked in the first two X-men movies, as well... aside from his height, Hugh Jackman played a fantastic Wolverine, and most of the characters remained consistent, even if the stories were not exactly the same. Is anyone here a Marvel fan? Yes. When I was a kid I read Thor, X-Men, and Daredevil. I'm a big Marvel fan and other than some groans about Thor 2 and Iron Man 2, both of which I liked, but was in the minority, the comic fans are very happy with the MCU. Consistently every time we think they're shipping what looks like a hacker (film so bad you hack and retch while viewing) they surprise us with a quality product. Iron Man 2 is actually my favorite of the three Iron Man films. The common favorite 3 is decent but the lava-power people are really pushing it for me, even for a CBM. The Thor films get better as they go. The first film is good but I always get kinda sleepy during the Rainbow Bridge fight at the end. I like The Dark World a bit more, and I think everyone agrees that Ragnarok is the best. The group running Disney's MCU has mostly managed to remain true to the comics while updating the characters, all while telling an engrossing overall narrative. I see this a lot and disagree. Marvel and Star Wars are two totally different beasts and I don't think much that Marvel Studios does would translate to Star Wars. How are the Marvel movies received by the pre-MCU fandom? Has there been anything like the hatred directed at the new Star Wars films? No. The MCU is worshipped like a god in Marvel fandom. The big crossover movie from last April grossed over $2 billion and the good guys totally lost. It's obviously the first part in a 2-part story that will be completed this coming April, but I can't enjoy it as a movie on its own. It needs a full story. It's like the last Harry Potter book that got split into two movies - the first part alone is only half a movie, like reading half the book. Black Panther last year grossed even more than the Avengers movie, and Black Panther was good. I don't get all the love with the half-movie, and I did not like the second Guardians of the Galaxy at all, but the MCU has 20 movies to date and most of them are decent to great. I own 17 of them. The current Fox X-Men franchise is just ok to me. I'm no zealot about the MCU, but I have to agree with MCU fandom that it overall is the pinnacle of Marvel movies, the first couple Spider-Man movies notwithstanding. The only group of CBM fans that seem to hate the MCU are the Zach-Snyder-is-Messiah camp, but they generally seem to dislike everything Marvel. As a CBM fan, I'm enlightened enough to realize that 'Marvel vs. DC' is a false dichotomy, and I like whatever I like from each with almost no comparison of them to each other. We are all free to enjoy both. Marvel and Star Wars are two totally different beasts and I don't think much that Marvel Studios does would translate to Star Wars. I see your point, but I do wish that Lucasfilm could find the happy medium of making films that both explore new ground while staying faithful to the past. Marvel is proof that it can be done, as well as proof that making a lot of movies in quick succession is not a bad thing if handled properly. There's been some hating on marvel, for black panther and capt marvel (won't say why).. BUT other than that, no i've not seen much hatred towards it. I'm the first to admit that I'm far more of a Marvel man than a DC guy, but I liked Wonder Woman alot. That said, I haven't watched any of the other DCEU movies, though I'm planning to see Aquaman this weekend. Judging by the ticket sales and reviews, it seems to be doing really well. As for the MCU, I like it alot as well. As for the Iron Man and Thor movies, I like both the first and third movies but the second ones were meh. Thor: Ragnarok was absolutely hilarious and a blast to watch. I loved Civil War, Spider-Man: Homecoming and Avengers: Infinity War. Black Panther was amazing. I can't wait to see Captain Marvel and Avengers: Endgame. I've seen Aquaman twice now. Epic adventure, amazing visuals. 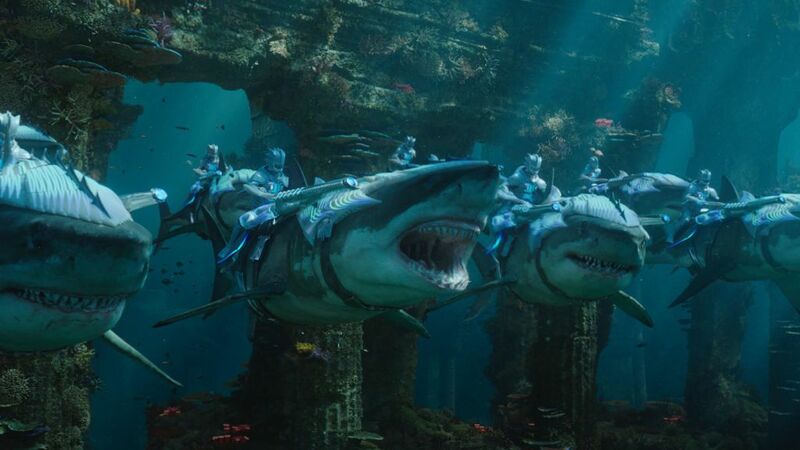 There are multiple kinds of undersea people in it, and one of them rides sharks as their battle steeds. I need to get to B&N and check out The Art of Aquaman because the movie is really inspiring to me for my Star Wars game. I didn't like Aquaman as much as Wonder Woman, but Aquaman is still a lot of fun. It's very popular. Worldwide it is on its way to grossing $1 billion. That's cool, but do the sharks have laser beams on their heads? They must have one hell of a low sublight speed, say 2-3. This bomber run speed does not qualify for space move value. When I saw how gently floates over the FO Destroyer I would give it km/h. I mean look at that - attack speed approach. and this SD arrival - cruising speed apprach. I've also been more of a marvel than DC person too.. BUT i have yet to see Aqua man (will wait till it hits redbox). For the DCU movies, i'd put Wonderwoman tied with Man of Steel for the top spot. This bomber run speed does not qualify for space move value. When I saw how gently floats over the FO Destroyer I would give it km/h. That won't work; space combat has to use SUs to fit with the system. More appropriate would be a rule that Fire Control suffers penalties based on how fast the bomber is moving; the faster the bomber, the harder it is to get the free-fall bombs to accurately deploy to hit the target.